Warm in one room… cold in another! It is a frustrating reality of winter. Hot air rises, cold air sinks so how can you maintain a nice, even, constant, reliable temperature – and enjoy consistent temps throughout your home, throughout the winter? As experienced HVAC technicians, we are constantly asked by homeowners how they can keep the same temperature going all over their homes, from level to level and from wall to wall. Whether you have a large single-family home, townhouse, duplex, condo, or apartment, here are some tried and true tips to a wall-to-wall warm home. Make sure your home’s heating, ventilation & air conditioning (HVAC) equipment – from heat pump to thermostat, valves to pipes – has been professionally inspected and winterized. This is not just a call for our service… it is entirely true. Professionals, whether it is us or another qualified HVAC company, can pinpoint inefficiencies which may result in your home’s HVAC not spreading the heat well enough. Pros use highly sensitive pressurization equipment to locate and seal leaks in ductwork joints and fittings. Unless someone’s going through them, keep exterior doors closed. An open door is a one-way ticket for your warm air generated by your home’s electrically powered HVAC system to fly away. Plus, if outdoors is substantially colder than indoors, the temperature inside will drop even faster. Remind the kids of this common-sense habit. Have your home’s exterior windows, panes and sills inspected for possible air leaks. In the winter, leaky windows mean lost energy, meaning higher energy costs. Rooms, where windows are leaking, can be significantly colder, too. Install more or thicker insulation in attics and exterior walls. A building is only as warm as its walls will allow. If you live in an older home or are unsure when the home’s insulation was last inspected, it’s a good idea to check it out. Otherwise, the heating system may need to go into overdrive to make up for the consistently lost heat. Run ceiling fans at the lowest speed, with blades pushing the air down. Warm air rises and always will. Once it’s as warm as you like it, keep it down where you are and spread it around. With the sorts of winters we often have around here in Ashburn, Leesburg, and Fairfax, it’s important to your family’s wintertime comfort that your home’s temperatures not vary too wildly from bedroom to basement. One of the major functions of your home’s modern HVAC system – the heat pump, the thermostat, the entire complex apparatus – is to help keep a balanced, constant temperature… at your preferred level of comfort throughout your home. However, nature being what she is, it isn’t easy. You can help your HVAC system keep your family comfy. Try these tips and see how you and your heating unit can keep your home comfy and isothermic all winter long. 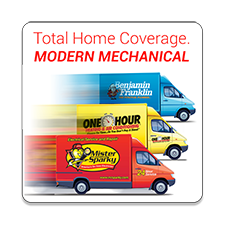 About Modern Mechanical and One Hour Heating & Air Conditioning: Serving Loudoun, Fairfax, Northern Virginia and the entire Washington, D.C., region with prompt, punctual, friendly, technically superior home services since 2009, including HVAC repair and replacement, diagnoses and parts, and indoor air-quality analysis. Call One Hour Heating & Air Conditioning today at (571) 421-1888 or make an appointment at www.ModernMec.com. Please stay connected with One Hour Heating & Air Conditioning on our Facebook page at http://www.facebook.com/modernmec to keep up with how you can help us continue to help our community and our world.